Chicago • After playing 10 games in China this year, “Big” Al Jefferson has officially retired from the NBA, according to a report from the Boston Globe. Jefferson, now 34, had a 14-year NBA career after being originally drafted by the Boston Celtics. He was later the returning centerpiece of the Kevin Garnett trade, before finding himself in Utah in exchange for Kosta Koufos and two first round picks. In Utah, Jefferson played 221 games, the most of any of the five teams he played for in his NBA career. He was consistent in a Jazz uniform, averaging 18.5 points and 9.5 rebounds per game. Perhaps his greatest Jazz game came in the stretch run of 2012, when Jefferson scored 28 points and pulled down 26 rebounds in 54 minutes of a triple-overtime win over Dallas that helped boost the Jazz to a playoff berth. His NBA game will be remembered for an accurate, hard-to-stop sweeping “push shot” in the lane, a convincing pump-fake on his jump shot that caused numerous young players to turn red in the cheeks — "One of the best pump-fakes I’ve ever seen, you know it’s coming but he still got people with it,” Derrick Favors said — and an overall approach to life in the NBA that tended to turn him into a locker room favorite wherever he went. Later, Jefferson was acquired by the Hornets for three seasons before signing with the Pacers for two as a bench threat. This year, he signed a deal with the Xinjiang Flying Tigers, but decided to come home in November. But now, he seems to have found the league that fits his nickname: the Big3 League, the 3-on-3 venture created by Rapper Ice Cube in 2017. And just as they hoped, it looks like Jefferson will be a draw for fans of the game, especially the post game. Jake Lindsey is home with his Baylor team during the NCAA Tournament, so what lies ahead now that his playing days are done? More basketball, he hopes. Donovan Mitchell heard about a former teacher’s daughter and friend who needed money to finish school. He gave her $25,000. “I’m definitely going to be tuning into the Big3 league this year,” Favors said. 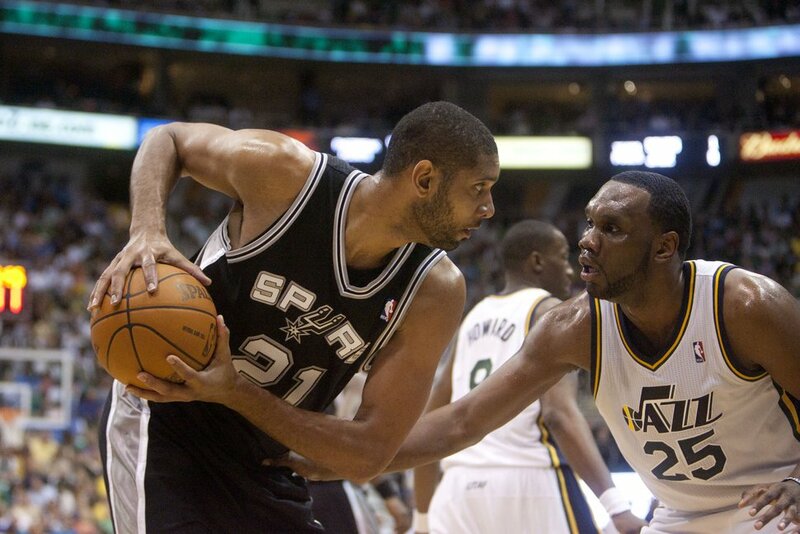 Jeremy Harmon | The Salt Lake Tribune Tim Duncan is defended by Al Jefferson as the Jazz host the Spurs in the first round of the NBA playoffs at EnergySolutions Arena in Salt Lake City, Saturday, May 5, 2012.